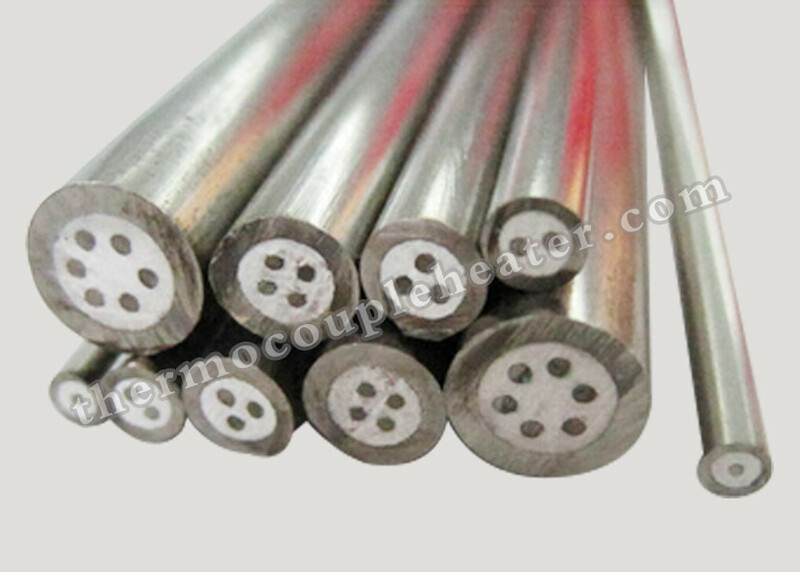 Mineral Insulated thermocouple cables are the core material to produce thermocouples. It typically comprises stainless steel or Inconel sheath, Magnesium Oxide (MgO) powder and thermoelectric conductors. Magnesium Oxide (MgO) powder is disposed in the sheath to maintain separation and electrical isolation between the sheath and the thermoelectric conductors . Magnesium oxide (MgO) is preferably used as the insulation material for the MI thermocouple cables because it is stable at high temperatures and pressure .It provides a high electricity resistance and is also economical . 1). The metal sheath can protect the inner thermocouple conductor against contamination, makes it moisture proof , weldable, compact and mechanically strong. 3). The small mass and high thermal conductivity of a properly made cable enables fast thermal response of the finished thermocouple assembly. 4). Different sheath materials can be selected to offer strong resistance against corrosive and extremely high temperature environments. This sheath material is most widely used in low temperature . Mainly used in chemical, food, beverage, and other industries where corrosion resistance is a must, which is also the lowest cost corrosion resistant sheath material . Subject to damaging carbide precipitation in 482°C to 871°C (900° to 1600°F) range. Max. temperature: 871°C (1600°F). Quite similar to stainless steel 304 except titanium stabilized for intergranular corrosion. SS321 is used to overcome susceptibility to carbide precipitation in the 482° to 871°C (900° to 1600°F) range. Main applications are aerospace and chemical . Max. temperature: 900°C (1650°F). It is the best corrosion resistance of the austenitic stainless steel grades. Good corrosion resistance in H2S. Mostly used in the food and chemical industry. Subject to damaging carbide precipitation in 482° to 871°C (900° to 1600°F) range. Max. temperature: 1150°C (2100°F). Similar to but better than 304 SS in mechanical and corrosion resistance. Also good in heat resistance. SS310 contains 25% Cr, 20% Ni. Not as ductile as 304 SS. Maximum temperature: 1177°C (2150°F) Continuous; 1260°C (2300°F) Intermittent. Similar to Alloy 600 with the addition of aluminum for remarkable oxidation resistance. Used for high temperature corrosion resistance , especially good in carburizing environments with good creep rupture strength. Can’t be used in vacuum furnaces! Susceptible to intergranular attack by prolonged heating in 538° to 760°C (1000° to 1400°F) temperature range. lengths and can easily be welded or brazed to other metals when proper techniques are used.